Plus, D23.com journeys to galaxies from a long time ago—and into the future—with a deep dive into the Star Wars universe and Marvel’s Guardians of the Galaxy. BURBANK, Calif. – APRIL 29, 2014 – D23: The Official Disney Fan Club celebrates the upcoming release of the eagerly anticipated Maleficent in the summer publication Disney twenty-three. Angelina Jolie and the creative team pull back the curtain on the surprising tale behind one of Disney’s most iconic villains. “I was afraid of her, and I loved her,” Jolie confesses in the cover story. Accompanying the piece is an in-depth look by animation historian Charles Solomon at the development of Walt Disney’s 1959 creative masterpiece, Sleeping Beauty, with rarely seen concept art and drawings. Disney twenty-three’s Summer issue, available exclusively to Gold Members of D23, also includes a behind-the-engine look at Walt Disney World’s newest theme park attraction, the Seven Dwarfs Mine Train, featuring striking images and interviews with the team responsible for creating the experience, which is based on the world’s first animated feature. Disney twenty-three also explores the Marvel universe, talking to star Chris Pratt about his wild and wacky Super Hero adventure Guardians of the Galaxy. All D23 Members are invited to visit www.D23.com for additional members-only content, including a talk with producer Don Hahn (The Lion King, Beauty and the Beast) about how Disney turned the animated Sleeping Beauty into the vibrant, live-action Maleficent. Disney twenty-three, which is delivered directly to fans’ doorsteps, is offered exclusively to D23 Gold Members as a benefit of their membership. The publication will begin arriving mid-May. The name “D23” pays homage to the exciting journey that began in 1923 when Walt Disney opened his fledgling studio in Hollywood. D23 is the first official club for fans in Disney’s 90-plus-year history. D23 gives its members a greater connection to the entire world of Disney by placing them in the middle of the magic through its quarterly publication, Disney twenty-three; a rich website at D23.com with members-only content; member-exclusive discounts and special events for D23 Members throughout the year. 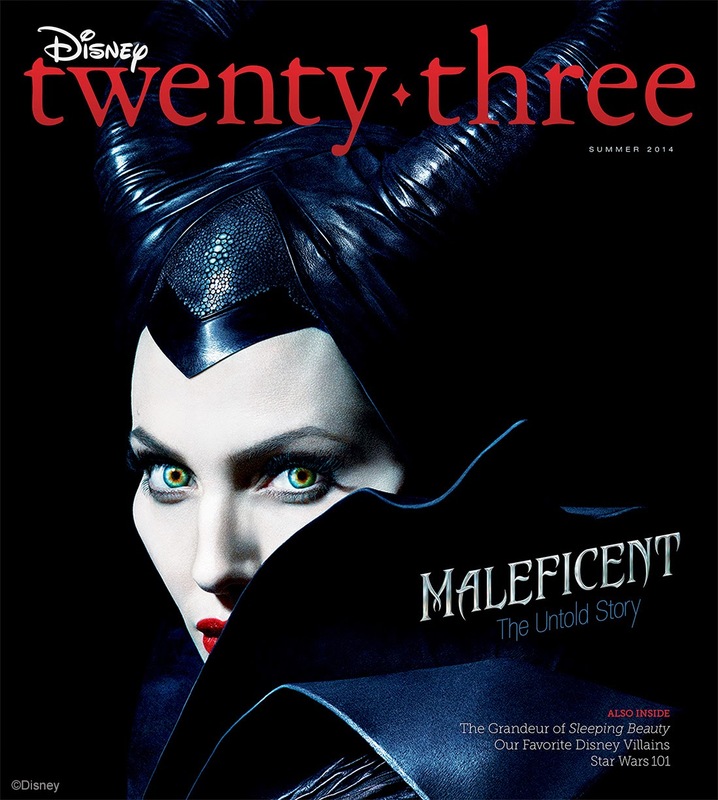 0 comments to "ANGELINA JOLIE CASTS A SPELL AS MALEFICENT ON THE COVER OF THE SUMMER 2014 ISSUE OF DISNEY TWENTY-THREE"